If you’ve been listening carefully you may have noticed that there haven’t been as many oil trains arriving in Albany lately. A year or two or three ago I used to hear the long, loud wail of the train whistles around the clock, when I was lying in bed early in the morning and at odd times during the day. For a while every bit of railroad track in and around downtown held stationary lines of those black tank cars, waiting to unload their dark cargo or waiting for the outbound tracks to clear so they could head back to the oil fields. Since 2009 the City of Albany has been a significant terminal, a literal faucet on a major highway through which petroleum flows. 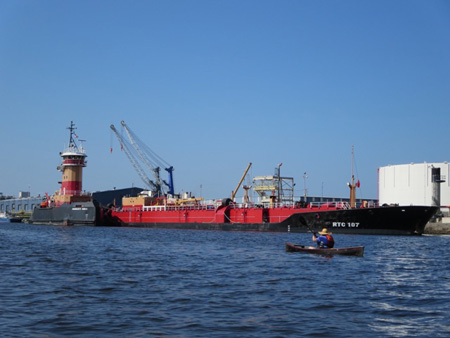 Crude oil extracted by fracking from the Bakken Fields of North Dakota arrives at the Port of Albany by rail and is poured into massive tank barges, which are towed by tugboat down the Hudson to unload into the refinery tanks located along the New Jersey shore. This fracking oil highway that runs through Albany, along with several others around North America, has had tremendous impact on the world economy and on international political stability. So far we’ve been lucky in Albany, there has been little negative impact on our City from the trains other than a few very minor spills on land at the Global facility on the north end of the Port. That, along with some annoyance to drivers waiting for the trains to pass over roadways. Local activists and thus local politicians have been deeply concerned with the dangers of this operation, with both the expectation of environmental damage and especially the risk of a fireball explosion that could destroy downtown Albany and kill thousands of people instantly. First, the good news. 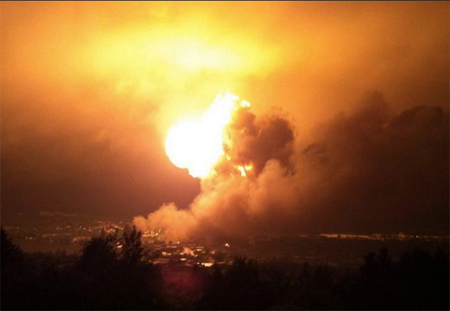 You may recall how back in June of 2013 these same oil trains caused a fireball that destroyed the Canadian town of Lac Magantic and instantly vaporized 47 people. Some of us can’t forget. 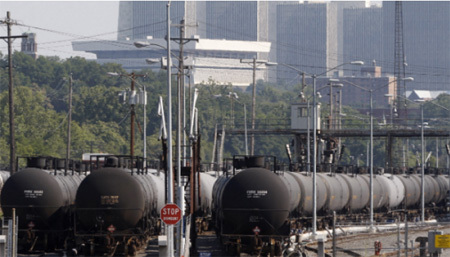 The good news is that the oil trains that are now arriving in Albany will not cause an explosion of that size and intensity, not at the Port of Albany or anywhere else in or near our City. Actually there have been something like 14 derailments with spills and fires since the Lac Magantic disaster. The biggest and most damaging derailments have been in Tennessee, in Virginia and the most recent this past May in South Dakota near the Bakken Fields. But despite the environmental damage and several big fires there were no fireball war-zone explosions and no deaths in any of these derailments. So why did the oil trains in Lac Magantic explode like that when the other derailments that happened afterwards haven’t? Unlike the later derailments, the tank cars in Lac Magantic were packed with volatile gasses, familiar substances such as butane, propane, ethane, along with massive quantities of the terribly dangerous substance hydrogen sulfide, which can kill you through asphyxiation, corrosion, poisoning and of course by explosion. When that line of tanks cars 16 miles from the US border broke loose on a hill and derailed, all it took was one spark from clashing metal to obliterate a community and murder dozens of innocent people. I say murder because the standard procedure before transporting crude oil has always been to siphon off these deadly gasses with preliminary refining. The outfit that loaded the Lac Magantic train that exploded, a Fortune 100 corporation called World Fuel Services, very deliberately did not do that mandatory preliminary refining that would have removed these explosive and toxic gases. These corporate executives did this to increase their profits, they are very much on record crying poormouth over their refusal to buy the necessary equipment to make the oil safe enough to travel. But between 2009 and 2013 World Fuel Services was not the only corporation that loaded these trains with deadly gases. Hess, Marathon, Whiting Oil and Gas to name a few continuously played russian roulette with the American people, using the trains as guns and their Bakken oil as bullets, or rather as bombs. While the psychopathic suits who run these corporations quietly put millions of people at deadly risk for years, government regulators allowed these bomb trains to roll even for months after the inevitable happened in Lac Magantic. According to news reports, federal regulators in the US have known about this practice since at least 2010 but did nothing about it. 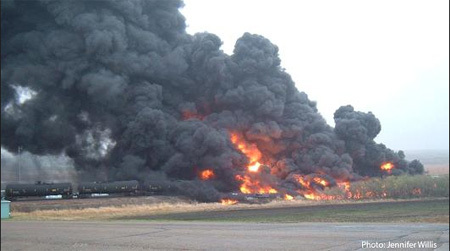 However, in February 2014, eight months after the Lac Magantic explosion, the Department of Transportation (DOT) inspected the Bakken operation and finally told these corporations to stop loading volatile gasses into the tank cars. They also discovered that these corporate executives were downgrading classification of the oil, in other words deliberately lying about how safe it was. And so the federal DOT fined these three corporations a total of $93,000 between them. Yes, that’s the punishment these executives received for lying about transporting deadly substances. Meanwhile, three of the grunt workers who were on duty that fateful night in Lac Magantic are still facing criminal conspiracy charges and the rail operators are facing bankruptcy and hundreds of millions in fines. You won’t be hearing about the government regulators or their political bosses being punished for allowing these corporate criminals to continue committing their crimes even though they knew damn well what was going on. I have yet to hear one single elected official admit that the federal government failed to do it’s job, these politicians don’t want to cause any responsibility to fall on themselves. Instead a few hapless working guys are being held responsible and the railroads involved are being held liable because railroads are considered politically incorrect. So in April of 2015, almost two years after the Lac Magantic explosion, the State of North Dakota finally decided to order frackers to remove all explosive gases before shipping oil by train or by truck. North Dakota, of course, is where the vast majority of Bakken Field fracking operations are located. This new set of regulations, which are reportedly more stringent than federal regulations, was handed down by a three member board that includes the governor of that State. Regulations are worthless if they are not enforced, after all there have been federal regulations in effect like forever that if enforced could have prevented Lac Magantic. Since the explosion, I’ve read reports in the media of the feds forcing the North Dakota corporate frackers to install condensate stabilizers like the frackers had done in South Texas. But so far no one in authority has come right out and said that the explosive gases are no longer inside those tank cars, no one that I’ve heard. And I’ve been listening for that. But now I’m confident that the deadly gases are gone from the tank cars rolling into Albany. 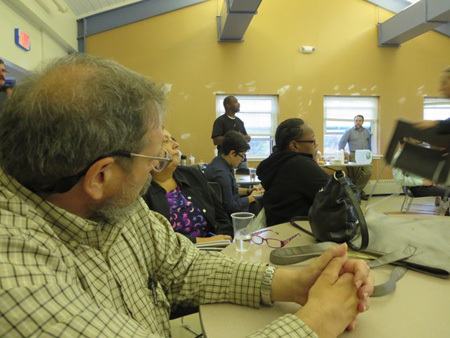 At the end of September the NY State Department of Environmental Conservation (DEC) held an informational meeting in the community room at Ezra Prentice Homes in the South End. About half of this residential neighborhood is set in a narrow corridor between South Pearl Street and a set of railroad tracks that are much used by the oil trains, the rest of the homes are across the street. In the City of Albany, public hearings and meetings like this are almost always attended by passionate well informed people who ask all the most inconvenient questions and are not afraid to contradict the authorities arrayed before them. As such they are usually raucous good fun to observe even if you don’t know much about the issues involved. Seriously, I don’t understand why more people don’t attend these, where else can you get entertained like that for no charge. It’s the issue at hand that makes these meetings interesting, or rather the interplay between authorities who are reluctant to clearly speak the truth and citizens who are angry and frustrated at being misinformed and ignored. As a friend of mine put it when I described this meeting to her, “People don’t know how to inform, and they don’t know how to be informed.” Yet I do give credit to the DEC folks for trying their best to communicate, it’s just too bad that for political reasons these State workers are all trained to beat around the bush instead of talking plainly. In fact, just about nobody in this region knew about the hydrogen sulfide and the illegal volatile gases in the tank cars until a certain local blogger posted a much read article detailing the problem in July of 2014. This article was picked up and disseminated by People of Albany United for Safe Energy (PAUSE) which formed in the wake of the Lac Magantic disaster and is calling for banning the oil trains from Albany altogether. There was nothing in that article that was new, but at the time few people locally were aware that this was an unnecessary threat to their very lives. 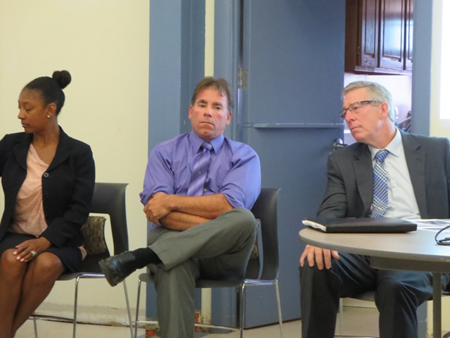 So at the Ezra Prentice meeting the DEC folks looked really grim as we the people lit into them for not solving these problems in downtown Albany with urgency the way they surely would if this were, say, rich suburbs like Clifton Park or Loudonville. The problem down here on South Pearl Street is not abstract, for years residents could smell the H2S wafting off the tank cars as they passed close by. Since H2S is a full spectrum poison, who knows what the cumulative health effects have been. No authority seems to want to look into that. Present at that meeting was the guy who does the actual testing to see if H2S is present in the neighborhood. His name is Matt Franklin, and he uses a handheld device which can measure as low as one part per billion (ppb) in the atmosphere. Most of the testing has only been done in the last few months, as the DEC folks pointed out, this is the only testing like this done in the State, which they said is a response to public demand. In response to my direct question, Mr. Franklin told us that he has taken oil samples directly from random selected tank cars, swirled them around in a jar, and tested them. Each sample, he told us, registered marginal amounts of H2S, that is, from 0 to 4 ppb. This is much lower than the amounts of H2S that are found in the exhaust of diesel engines, from the Albany storm drains that all too often carry raw sewage, and from the breezes wafting over the nearby sewage treatment plant. In addition, I noted a comment from a longtime resident of Ezra Prentice whose back windows open onto the train tracks across the yard. She had much to complain about at the meeting, but she stated clearly that although she had been smelling the H2S odor for years, during the last year the odor had ceased. This fell precisely in line with the quiet enforcement of safety regulations in North Dakota, and it confirms Mr. Franklin’s assertions. Thus I am confident that the tank cars no longer carry volatile gasses. Preliminary refining with a condensate stabilizer at the fracking site removes all the gases at once, so if H2S is gone then all of them are. Mr. Franklin seems quite sincere and proud of his own integrity, he had no problem with my putting his face and name on this blog. I believe what he says. Of course there still could be an oil spill and a fire, but this would most likely happen at the Port where it would remain isolated. That doesn’t mean it wouldn’t be a disaster, oil would coat the bottom of the river and smoke would waft over the South End neighborhoods and force evacuation. Perhaps this risk is the price we pay for dependence on oil to power our lives, but there are many ways to minimize the risk to ourselves and to our environment. For example the tank cars could be better built. In addition to the DEC guys at the meeting, we had an abbreviated presentation from Robert Montgomery, Chief of the State Department of Transportation Rail Safety Inspection Bureau, telling us how the State has concentrated heavily on watching the oil trains. 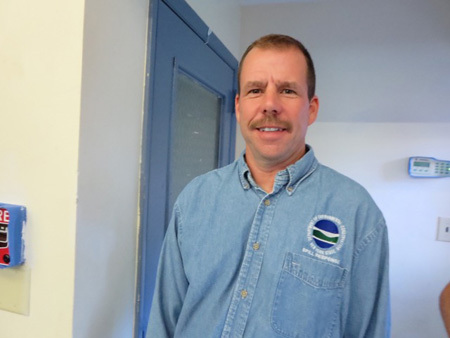 He was the one who let drop, almost as an aside, how North Dakota now requires that H2S and other volatile gases be removed from the oil before transporting. Really, that’s one of the details that should have been placed front and center. Mr. Montgomery told us there have been about 20 violations handed out by his bureau at the Port of Albany since February of 2014, all of which are fines. He also discussed how the safer 111 tank cars, which as several people pointed out are far from ubiquitous, are being superseded as of October 1st with newer and safer 1232 tank cars. These are double hulled and of a thicker gauge of metal than the 111s. I asked him about the recently refurbished train tracks that run into the back of the Port and terminate at the Global facility. I noticed that the tracks were being rebuilt last year when The Wife and I went boating up Island Creek. Recently there was a newspaper article that mentioned the new tracks, they are now being integrated into a Port expansion project in the southern part of the Port, which includes new docks and the construction of a 56,000 square foot climate controlled shed for handling giant equipment such as turbines. 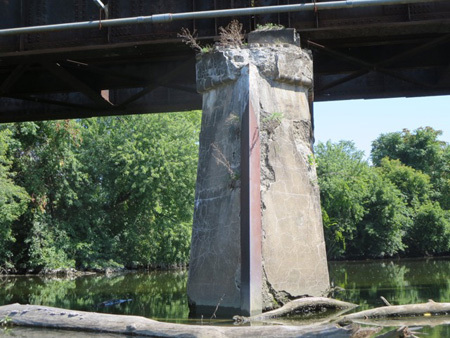 The tracks cross Island Creek over an old concrete bridge which sits in the middle on a pillar in the water. This year I noted to my alarm that the pillar is decaying badly. On one side where concrete is sloughing off the pillar we now have a metal bar for support, this is the only repair I could see that had been done. 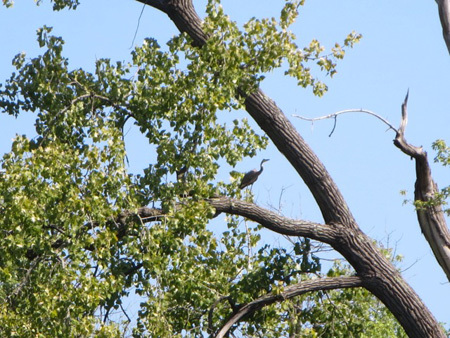 Really, you can’t see any of this unless you paddle a boat up Island Creek. To my amazement Mr. Montgomery claimed to have no knowledge of this newly refurbished track or of the condition of the bridge, and he had not heard of any plans to run oil trains over this bridge. I was glad to see him make a notation as I spoke, perhaps he will follow up on this before the bridge collapses under the weight of a fully loaded oil train. 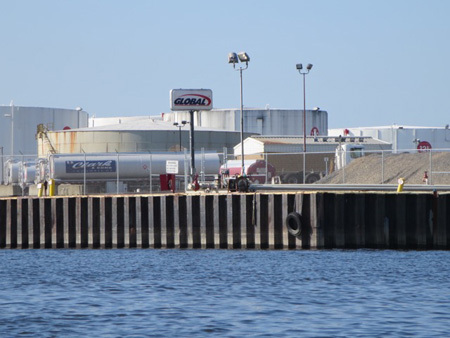 A year ago Port officials were looking to accommodate more oil trains arriving, but since then the number of trains has slacked off considerably. The reason is that the price of oil has dropped way down because there is a glut of oil on the world market. Partly this price drop is caused by overproduction, but at the same time worldwide demand for oil is starting to decline. We all see this at the pump, the local price of 87 octane gas is down as low as $2.30 a gallon at some stations. 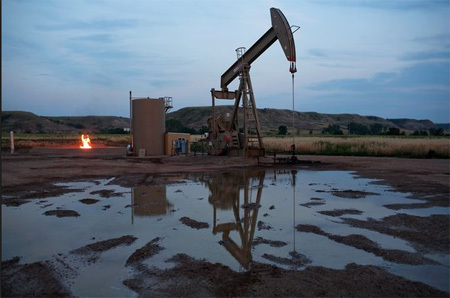 This price drop has caused about half of the operating fracking wells in North Dakota to be decommissioned, and it has forced Saudi Arabia to drop prices to it’s lowest levels in many decades. And most spectacularly, Shell Corporation has announced that after spending some $7 billion that it will no longer pursue drilling new wells in the Arctic off the coast of Alaska. This oil glut has forced the tar sands shale oil operations in western Canada to all but shut down. This thick gooey glop is considered the lowest quality oil available, fetching the lowest prices for a barrel while at the same time the most expensive and energy intensive oil to produce. The corporations that have heavily invested billions into tar sands are sitting and waiting, hoping that the price of oil will go up so that they can resume operations, but that is looking unlikely. A few years back Global tried to install heaters at their Port facility in anticipation of receiving tar sands oil. This glop is like tar in cold weather, it has to be warmed before it can be poured into the hold of a tanker, otherwise it will clog the equipment. No one in Albany is crying about this loss, the mere thought of what a spill of tar sands would do to the river is almost unbearable, this kind of likely scenario has served to galvanize activism against allowing the stuff to be sent here. The DEC quietly approved the heaters, but word got out and the public went ballistic, which forced the State to schedule public hearings. After these sessions the DEC promised to pull the approval (“rescind the negative declaration” in legal parlance) but after two years they have failed to do so. At the moment this is all moot, the heaters have not been installed and tar sands oil is unlikely to show up around here any time soon. You want to see the worldwide oil glut for yourself? 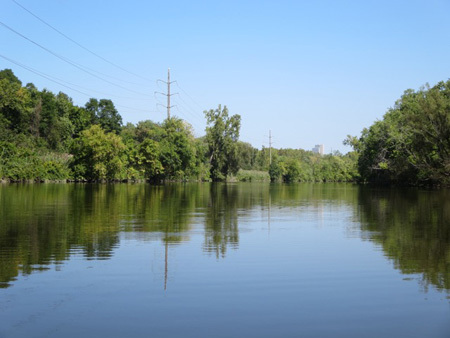 Bring a motorboat to the launch in North Albany (or a paddle boat to the mud flats of Island Creek Park in the South End like we did) and proceed south on the Hudson River toward Bethlehem and glance at both sides of the river. You can’t help but note dozens and dozens of oil storage tanks, most of them new shiny white with many having been built in the last year. Big tanks like that are built for a reason, the fact is that there is so much oil being produced domestically that there is nowhere left to store it. Oil distributors are trying to hold onto as much oil as possible hoping for the price to go up again. 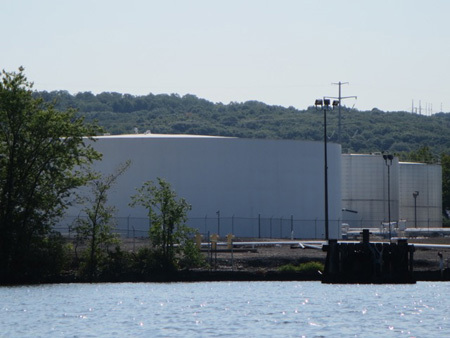 Reportedly there is no storage space left anywhere in the US, new tanks are spoken for before they are built. The ongoing contraction of the oil industry is bad news for anyone who has an oil related job and is hit with layoffs, and it’s an annoyance for anybody who owns oil stocks. But for everybody else this is a great development. Lower prices for gas at the pump means more money in the pockets of regular folks, and if the price of oil remains low this will have a positive ripple effect throughout the real economy. Meanwhile, burning of fossil fuels is slowly being cut back by increasing use of solar panels, which are becoming competitive with other forms of energy generation, and by wind turbines. This is the best news possible for the rapidly growing problem of Global Warming and the resultant climate change. So we are slowly heading in the right direction, but are we moving fast enough to save our civilization from collapse. I sure hope for the best, this is a race I want to win. This is an ongoing mess in our community! After meeting during 2014-2015 at least 25 times to deal with this EJ issues in the South End, Global will again heat this thick glopy tar oil to allow easy pouring during the cold seasons. This appears to be a permanent at the Port of Albany. We must continue to brace ourselves for a disaster. Investigative journalism is alive and well in the South End. Thank you, Certain Local Blogger! Since I moved in a decade ago I've smelled a nasty/chemical/asphalt/toxic smell at my house on Delaware Ave, Albany at night and early morning (purposefull release of nasty air when we're all asleep?). I haven't noticed a decrease. I wonder what's causing it. I've kept records, but when I call DEC they say "inconclusive" due to lack of wind which would apparently help to track the trajectory of the air pollution's track. I'm still trying to get DEC's attention. My point being, I wonder if the smell comes from the trains. If not, then I'd like to know where.